AHEALTH » 12 Steps to Health, Naturally… Book Launch and Introducing the new advance Hijama Blood Analyst course and rakha Fitness. 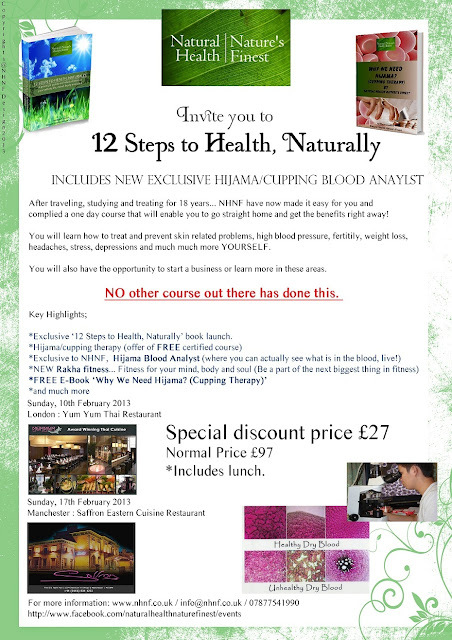 12 Steps to Health, Naturally… Book Launch and Introducing the new advance Hijama Blood Analyst course and rakha Fitness. 12 Steps to Health, Naturally. We are launching TWO health books and one of which is FREE. Introducing our EXCLUSIVE new course; HIJAMA BLOOD ANALYST and new fitness course RAKHA. And SADLY, this is also a FAREWELL event to our Director and Founder Ms Anisa Kissoon for she will be saying goodbye and venturing into other works and concentrating on those whom she loves dearly. We NHNF thank her for her contribution in HIJAMA, our Muslim community and to our life. Without her efforts we would not know about Hijama and now she’s introducing her last TWO secrets, ‘Hijama Blood Analyst’ and ‘Rakha’. She’s also will be discussing her ‘12 Steps to Health, Naturally’ and ‘Why we need Hijama’ books. NEW YEAR, NEW YOU, NEW GOALS, NEW LIFE! BUT without good health what can you do? With people now waking up and realising that all these pills and wrong information is NOT helping, many are turning to alternative methods of treatment… The question is now what do we do? Well we have put together the best of the best! After travelling, studying and treating for many many years… NHNF have now made it easy for you and complied a one day course that will enable you to go straight home and get the benefits right away! NO other course out there has done this!!!! You will learn more about how to take care of yourself than your doctor! You will be able to put these steps into action and start living a more healthier life and more importantly help and teach yourself, family and friends. You will learn how to treat and prevent skin related problems, high blood pressure, fertility, weight loss, headaches, stress, depressions and much much more. You will also have the opportunity to start a business or learn more in these areas. If you want this tour in your town or city please contact us. For more info on event or to enrol please see www.nhnf.co.uk and sign up to be members. Helping you live life naturally….